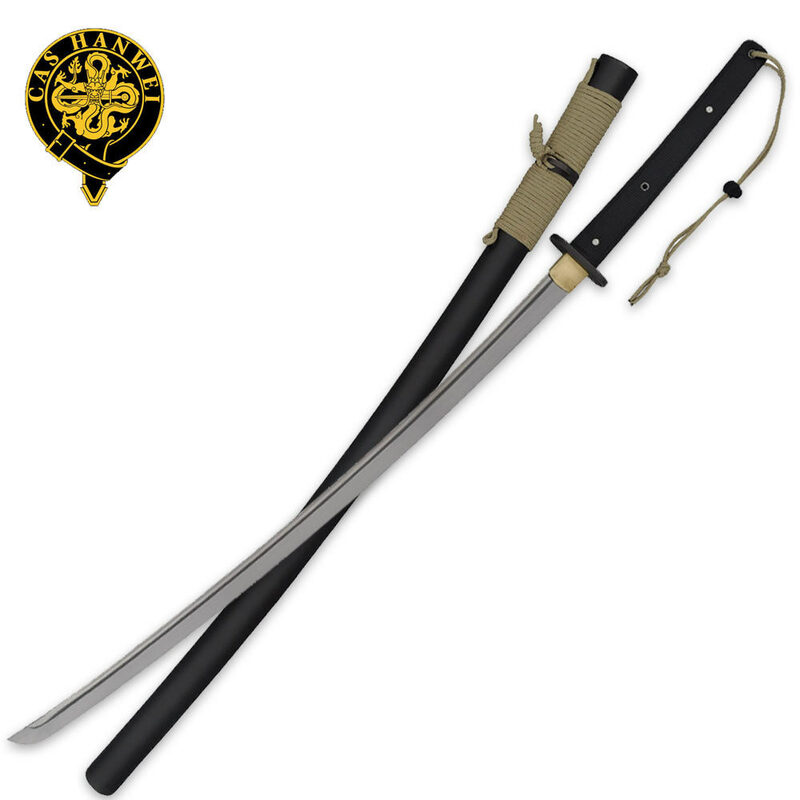 Next in line after our incredibly popular Tactical Wakizashi, the Tactical Katana has all of the same features and more! The 5160 high-carbon spring steel blade is plasma coated for corrosion protection and features a checkered Kraton handle for a secure hold. The guard and the handle feature lanyard holes which, with the included ParaCord, provide a number of carrying options. The fiberglass scabbard construction eliminates water absorption and adds less than 10 ounces to the weight of the sword. With the accent on light and quick, one-handed operation is the norm but two-handed slashing power is available when needed. Blade Length: 27 1/2 in. Handle Length: 10 1/2 in. This is probably the best sword on this site.. Or was on this site, as it's no longer available, however I seemed to have gotten the last one. It's an awesome cutting machine.. Beautiful sword as well. I thought it would be thicker. It's 4/16's of an inch thick at the base, and stays that thick the hole way down the sword. The balance it a bit off from a traditional katana making it a little hard to use. As for the blade, its fine. A bit duller than i like, but will make a cut straight out of the box. If your looking for a good show peace this is by all means its a great talking and goofing around sword, but if you want something suitable for real training, practice, or practical use this isn't it. not as sharp as i had hoped and doesnt lock into the sheath to well and the handle is kinda slick but it is a good blade and is really sturdy. I just got my sword today after ordering it two days ago, and I am very pleased. The sword was everything I had hoped for and I will get plenty of enjoyment out of it. I am very pleased with the quality of the sword for the price point.